Buyer means the individual or organisation that buys or agrees to buy the Training Services from Computer Tutoring. Contract means the contract between Computer Tutoring and the Buyer for the provision of Services incorporating these Terms and Conditions. Services means the training services that the Buyer agrees to buy from Computer Tutoring. Terms and Conditions means the terms and conditions for the provision of Services set out in this agreement and any special terms and conditions agreed in writing by Computer Tutoring. Any variation to these Terms and Conditions (including any special terms and conditions agreed between the parties) shall be only be applicable if agreed in writing by Computer Tutoring. The price of the training shall be that stipulated on the Website unless otherwise agreed with Computer Tutoring Limited. After the booking form has been completed Computer Tutoring shall confirm by email details of the course booking along with the total price and any payments made to Computer Tutoring Limited. The full fee, including VAT, is payable 10 business days in advance of the date of the first course. Training dates that have been reserved within the next 10 days, will be confirmed upon receipt of a purchase order or by course payment being made prior to the course. Immediate payments can be made via bacs transfer, credit card or PayPal. If you wish to be invoiced, an invoice for the full fee will be dispatched on receipt of a booking form. The Buyer has the right to cancel the training without charge up to 7 working days BEFORE the training is due to commence. If cancellations are made within 7 working days of the training commencing charges will apply (please see below). Cancellations made up to 7 working days BEFORE training will receive a full refund or / and another date can simply be arranged. Cancellations made 4 – 6 working days BEFORE training will receive a 50% refund. Cancellations made 0 – 3 working days BEFORE training will NOT be eligible for a refund. 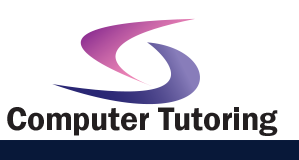 Any equipment provided by Computer Tutoring Ltd for the duration of the course (i.e. laptops & projectors) are to be treated with the utmost care. Any damage caused due to carelessness or negligence on the part of a training delegate will be payable by the buyer. Computer Tutoring may choose not to accept a request for training for any reason. Computer Tutoring reserves the right to periodically update prices on the Website, and these prices cannot be guaranteed for any period of time. Computer Tutoring reserves the right to cancel a course at any time without liability. In these circumstances delegates will be offered an alternative date or a full refund. Computer Tutoring shall not be liable to anyone for withdrawing the Services from the Website. Computer Tutoring shall be entitled to alter these Terms and Conditions at any time but this right shall not affect the existing Terms and Conditions accepted by the Buyer upon making a purchase.